Police said Nytina Raymond (inset) posed as an Uber driver to pick up a victim at a bar in Old Town. A Wisconsin woman posing as an Uber driver picked up a man in Old Town early Saturday and then robbed him at gunpoint with the help of two juvenile males, police said. Police tracked activity on the victim’s debit card to arrest the three at a Niles shopping center about an hour later. 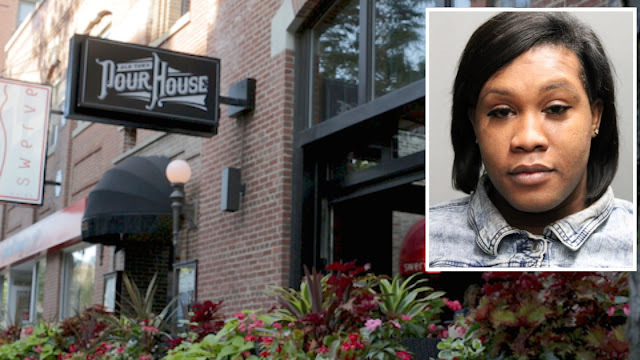 Police said Nytina Raymond was driving with the teens in her car when she picked up the victim at Old Town Pour House, 1419 North Wells around 12:20 a.m. While driving toward the man’s Lincoln Park home, one of the juveniles pulled out a gun and demanded the victim’s phone and wallet, according to authorities. The 24-year-old was released after the offenders successfully withdrew money from his account at a Chase ATM in the 1500 block of North Kingsbury. Please support CWB's newsgathering efforts with a donation to our Tip Jar. Police responded to the victim’s home and immediately began tracking activity on his debit card. Raymond and the two juveniles were arrested with the assistance of Niles police officers at a Walmart store in the 5600 block of West Touhy around 1:55 a.m.
Raymond, 24, of Germantown is charged with one count of felony armed robbery and one count of robbery. She is due in bond court this afternoon. The minors, ages 16 and 17, each face the same counts in juvenile court. Chicago police issued a community alert on June 20 that warned of armed robbery offenders who posed as Lyft and Uber drivers to pick up victims at bars on the North Side. The alert offered only a vague description of the offenders: a black female between 20-40 years of age and several black males. Police today declined to say if Raymond and the teens are suspected of committing similar crimes.